Legendary theatre company Maly Drama Theatre arrive in the West End for a highly-anticipated season, reprising two of their smash-hit productions. 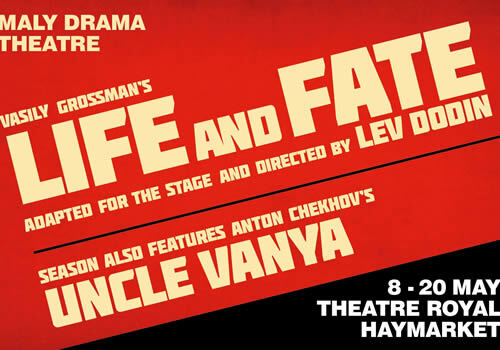 Originally hailing from St. Petersburg, the Olivier Award-winning group perform the celebrated Uncle Vanya and Life and Fate at the Theatre Royal Haymarket for strictly limited runs. First performed in 1898, Uncle Vanya is one of Chekhov’s best-known dramas, following Vanya and his niece Sonya as they hand their estate back to Professor Serebryakov, Sonya’s father. But when the Professor returns from the city with his young, stylish wife Yelena, tensions reach a dizzying height as Vanya and Sonya’s quiet lives are turned upside down. Described as ‘the finest ensemble theatre in Europe’ by Peter Brook, the Maly Drama Theatre company present the tragicomic masterpiece as part of a double-bill, which includes their other renowned production Life and Fate. The company are the first international troupe to receive an Olivier Award, for their production of Stars in the Morning Sky. Sergey Kuryshev stars as the titular character, alongside Ekatirina Tarasova as Sonya, Igor Ivanov as Professor Serebryakov and Ksenia Rappoport as Yelena, as well as Igor Chernevich, Ivan Chepura, Natalia Akimova, Oleg Ryazanstev and Vera Bykova. Uncle Vanya is directed by Artistic Director Lev Dodin, whose 35-year tenure has earned the company multiple awards, including state prizes and Golden Mask Awards. The show is presented by Oliver King and Ekaterina Kashyntseva for Belka Productions, with the support of Roman Abramovich, Sir Leonard Blavatnik, Yuri Shefler and Alexander Machkevitch. A tale of thwarted dreams, dashed hopes and unrequited love, Uncle Vanya is a thrilling staple of plays, performed by one of the world’s leading theatre companies. The production plays at London’s Theatre Royal Haymarket for a strictly limited run, from May 15th to May 17th 2018. Please note that Uncle Vanya is performed in Russian with English surtitles. Uncle Vanya is suitable for those aged 16 and up.